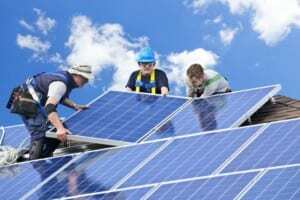 Investing in Solar Roof Panels – What Are the Pros and Cons? As sustainable energy continues to gain renewed ground, solar panel roofing is increasingly more popular today. If you’re looking for a brand new, energy-efficient and eco-friendly way to increase the usability of your roof, this is the perfect solution. But what makes investing in solar roof panels such a great idea? First of all, it’s important to keep in mind that solar panels will actually reduce your energy bill. They don’t just keep your AC from working too hard, as is the case with most cool roofing technologies, but they literally use the sun’s energy to produce energy that you can use for yourself or even feed into the grid. Another advantage of solar panel roofing is that, because it’s a sustainable, eco-friendly product, it offers homeowners and companies who use it tax benefits. Additionally, if you have a building you use for your business that has a solar panel roof, you can use it to market your company as environmentally friendly. Now, don’t get us wrong, solar panels can be expensive, and solar panel roofs are a little more special in that they blend the concept of a roof with that of a solar panel. So the price is somewhat higher than that of a similar solar array. Nevertheless, the amount of space you save with it, along with the many other benefits it brings, makes a solar panel roof well worth considering. Contact eco friendly Fort Collins roofing company solar panel installation teams to find out what will work best for your property and budget!